Residents wade with their belongings through flood waters brought by Tropical Storm Harvey in Northwest Houston, Texas, Aug. 30, 2017. Tropical Storm Harvey was downgraded to a tropical depression late Wednesday as it moved away from the coast and weakened, but it was still a danger. The National Hurricane Center warned that catastrophic and life-threatening floods would continue in southeastern Texas and parts of Louisiana for the rest of the week. Harvey could also bring soaking rain and the risk of floods as it drifts to the northeast and into the mid-Atlantic by the end of the week. The storm is leaving behind record-breaking floods, enormous destruction, and heartbreak that has grown hour by hour in Texas and Louisiana. The casualty toll continued to rise in Texas, where up to 31 deaths were blamed on the storm. President Donald Trump, who visited parts of Texas a day earlier, said the crisis brought out the strength, love and resolve of the American people, with both neighbors and strangers helping each other. The center of the storm's harshest effects shifted east Wednesday from Houston to eastern Texas, including Beaumont, a city of 110,000 that was cut off by floodwaters on all sides. Reports on rescue and recovery efforts focused on the tens of thousands of people who have been taken to shelters, including many who were plucked out of floodwaters by helicopters. Houston residents began to trickle back into the few neighborhoods where roads were passable, to see what Harvey had done to their homes. Disturbing scenes greeted many people who found rooms full of destroyed furniture, mud-covered floors and carpets, and ruined possessions. Bob Campbell walks through debris after returning home after Hurricane Harvey, in Port Aransas, Texas, Aug. 30, 2017. Most Houstonians who could go home simply sighed and said there was nothing to do but clean up and start over. After drifting back into the Gulf of Mexico, the storm reversed course again and made a second landfall Wednesday in parts of southeastern Texas and far western Louisiana. The mayor of Port Arthur, a smaller city near Beaumont that lies about 90 miles (145 kilometers) east of Houston, said his entire town was under water. A civic center that was being used as a shelter had to be evacuated when it started flooding. Rescuers found an unspeakably sad sight in Beaumont: a toddler clinging to her dead mother's body floating in the water. The child was recovering at a hospital. John Paul Klotz, 80, is pulled on a boat by U.S. Border Patrol Agents Steven Blackburn, left, Ramiro Rodriguez, top center, and Juan Flores during a search-and-rescue operation in a neighborhood inundated by floodwaters from Tropical Storm Harvey in Houston, Texas, Aug. 30, 2017. Texas Governor Greg Abbott said Wednesday that the disaster area resulting from Harvey was "far larger" than that of Hurricane Katrina, which overwhelmed New Orleans, Louisiana, 12 years ago, and of Hurricane Sandy, which hit the area around New York City five years ago. Federal Emergency Management Agency chief Brock Long said FEMA was still "in lifesaving, life-sustaining mode." Long said 32,000 people were in 230 shelters, with another 1,800 people housed in hotels. FEMA has served about 5 million meals, and the agency reported 210,000 people had registered for government assistance. Abbott said 14,000 National Guard troops had been called to duty to help rescue efforts, and another 10,000 were on the way. He said 8,500 people had been rescued from the floodwaters. An emergency response boat passes a boat that was displaced by the effects of Hurricane Harvey, in Port Aransas, Texas, Aug. 30, 2017. U.S. Coast Guard Commandant Paul Zukunft said emergency calls continued to come in at a rate of 1,000 per hour on Wednesday afternoon. Trump, speaking Wednesday during a previously scheduled appearance in Springfield, Missouri, praised emergency workers as heroes whose "courage and devotion have saved countless lives." "In difficult times such as these, we see the true character of the American people," he said. "Their strength, their love, and their resolve. We see friend helping friend, neighbor helping neighbor, and stranger helping stranger." The White House said Trump planned to return to the storm-ravaged area on Saturday. Wings of Rescue co-pilot Jose G. Martinez reaches for one of the last of a load of 35 dogs from Texas shelters flown to make space for companion animals rescued in the Hurricane Harvey aftermath, in Seattle, Aug. 30, 2017. 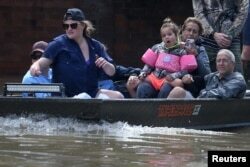 Celebrities have contributed tens of thousands of dollars for storm relief. The Associated Press reported rap star Bun B, a Houston native, was gathering talent for a hurricane relief concert to be televised on four national networks September 12. On a smaller scale, the owner of a large retail furniture company in Houston opened his showroom, filled with beds, couches and easy chairs, to any and all storm survivors. Media reports said the publicity-shy executive was in effect spending about $30,000 per day on the impromptu shelter. People ride a boat though flood water after being evacuated from the rising water following Hurricane Harvey in a neighborhood west of Houston, Texas, Aug. 30, 2017. Even as the storm weakened and began moving faster Wednesday, meteorologists said catastrophic and life-threatening floods could continue in Texas and Louisiana for the rest of this week. Damages from Hurricane Harvey are expected to amount to scores of billions of dollars. When it stalled over southeastern Texas after its first landfall Friday night, Harvey dumped more than 50 inches (130 centimeters) of rain — the most ever from a single storm in the continental United States — over a wide area. VOA's Celia Mendoza contributed to this report.